Allwinner has just announced a new quad cortex ARM Cortex A7 SoC for entry-level Android tablets. 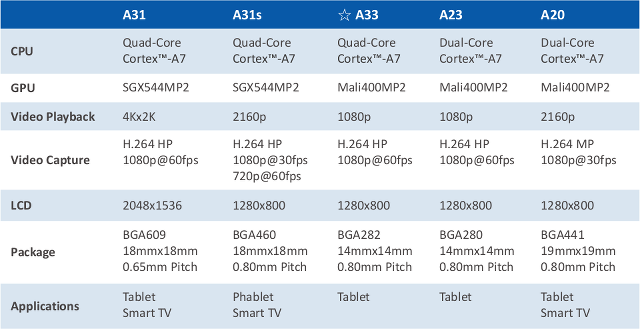 AllWinner A33 shares many of the features of AllWinner A23 dual core Cortex A7, including an ARM Mali-400MP2 GPU, and provides pin-to-pin compatibility, with the main difference being the upgrade from two to four Cortex A7 cores. AllWinner A33 will support Android 4.4 and above, so no official multi-OS support like other higher-end AllWinner SoCs. You may have noticed AllWinner A33 is provided in a BGA282 package, and AllWinner A23 in a BGA280 package, so we’ve got two extra pins there… It could mean you can’t simply replace A23 by A33 on exiting designs, but it should be possible to make a new board that supports both A23 and A33, just like it is done today with AllWinner A10 and A20. AllWinner A33 is sampling now, and the company expects the first commercially available tablet based on the platform to be available in July. So this is then another SoC from Allvinner with CedarX VPU without open API, source code, or GPL compatible libraries? A23 was deliverd with OpenMax as well. The OpenMax interface is a “software only” solution. The hardware CedarX did not change, much, nor did the unclear license, versioning and ownership. They just added the OpenMax interface besides their own to make it more appealing to use with Andriod as they choose OpenMax as the standard interface for Video acceleration. OpenMax has always been based as software Just like OpenGL, DirectX. They are software abstraction layers for hardware. The “open source” solution for Cedar is the Cedarus project “sunxi-vdpau” where the vdpau interface was chosen for interaction with the hardware. The question remains, when we will see a dev board supporting linux for Allwinner A33!? Unlikely because there’s no HDMI output, so it would just be a board for LVDS or/and a MIPI interface. That’s also why there’s no A23 board.